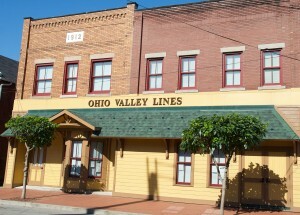 Ohio Valley Lines: WELCOME to the NEW Ohio Valley Lines website. ALL ABOARD!! Welcome to Ohio Valley Lines, a Model Railroad, Museum, and Library located in Ambridge, PA, just north of Pittsburgh. We invite you to visit us during our Open House on Saturdays and Sundays between Thanksgiving and the first weekend in January. If you are interested in becoming a member, more information can be found on the membership page. WELCOME to the NEW Ohio Valley Lines website. Most sections are still under construction but we hope you find the layout more useful and easier to navigate. Subscribe!! Get email alerts about new website posts! All content Copyright (C) 2017 Ohio Valley Lines. Picture Window theme. Powered by Blogger.